Regular readers will probably have gathered that I’m some kind of soft liberal pinko pacifist. Well, that’s the way I like to think of myself anyway. However, hidden in every pinkofist is a raving authoritarian fascist. News of rioting and looting by mobs of thugs in London both saddens and outrages me. I am a South London girl. If anyone in my family had ever had a silver spoon it would not have been shoved in their gob. Seemingly people have been in looted shoe shops trying out the sizes and styles. Now, if this doesn’t show that the British are a higher class of thug I don’t know what does. Whole families are turning up at stores with trollies and wheeling away televisions and washing machines. Police are being attacked with petrol bombs and angsting community leaders are already on the radio telling us the cause of the problem. YES!!!! It’s all the fault of the POLICE. Well, I never doubted it for one minute. Of course the police are to blame. They didn’t arrest all the terrorists before they blew up London. They didn’t arrest all the journalists who were hacking phones. They were not sufficiently sensitive to the community before they tried to sort out gun crime/mugging/drugs/burglary and deception by politicians. Just ban the bloody police and we can all live in lentil land, loving all our gun toting drug dealing neighbours. Bref – London police have a tough job. I lived in Brixton (South London) when it was just an all day, every day septic crime scene. A friend was punched in the face by a robber while she was holding her baby. He got her gold necklace and sneered. No Buddhist lentils on the boil today. Just me. In St. Savinien, there is calm. 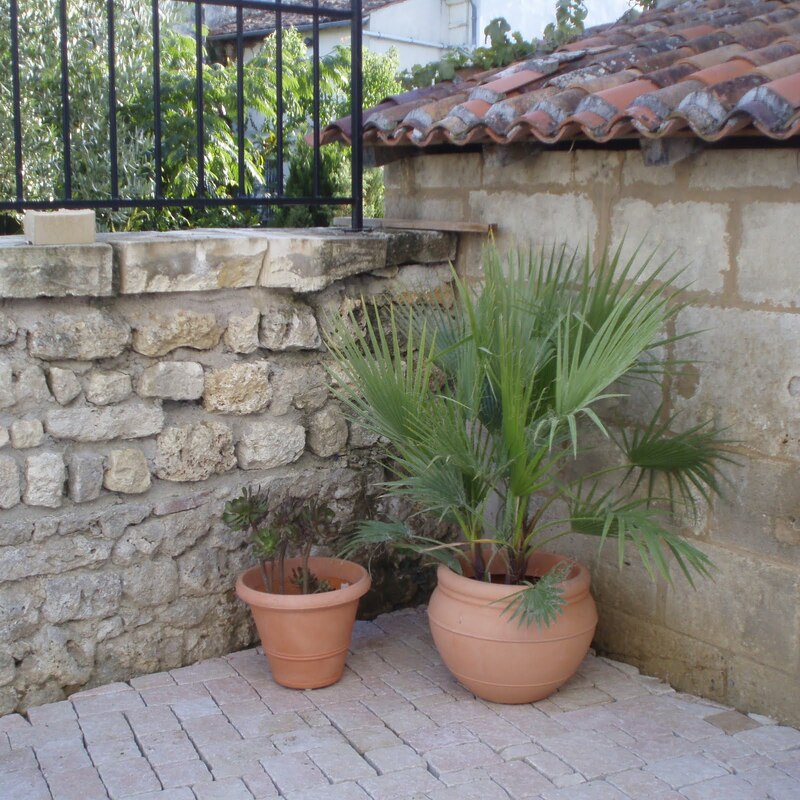 Since La terrace nears completion I set out to obtain the finishing touches…..that is to say, plants. Tomorrow I will call a meeting of le tribunal de terasse and reveal my policy of green appeasement. I know they have been muttering about my wall to wall pavé. I’ve put on a photo of my green cred. Do you think it’ll be enough? Now a word to all you would be builders and DIY optimists. In France they have a kind of sand called “sable de Remblai”. Some people call it rabbit sand and it is sold for putting the levelling layer under paving and cobbles. If you think you need say – 10 cubic metres, buy at least 20. I once tried reading Stephen Hawking’s book ” A Brief History Of Time”. Well, being a fellow genius it was easy to follow until I got to the issue of everything being compressed into a “singularity” whereby there was nothing from which came ALL. Now, of course I fully accepted all of the intellectual aspects of his mathematics – but it was only when I encountered rabbit sand that the subject really spoke to me. Much can truly compress into nowt! Emma thinx: Singularity – what is the point of it? This entry was posted in Emma Calin, English Working Class Life, France, Social Comment by emmacalin. Bookmark the permalink.